Shree Choudeshwari Temple is in Karnataka State, Shimoga district, Sagara Taluk’s. Prosperous place named Sigandur. Shree Devi kshethra has history of over 300 years. Sigandur kshethra is near to Thumari, 42 KM from sagar town. Mother choudeshwari is called as “Sigandureshwari”. 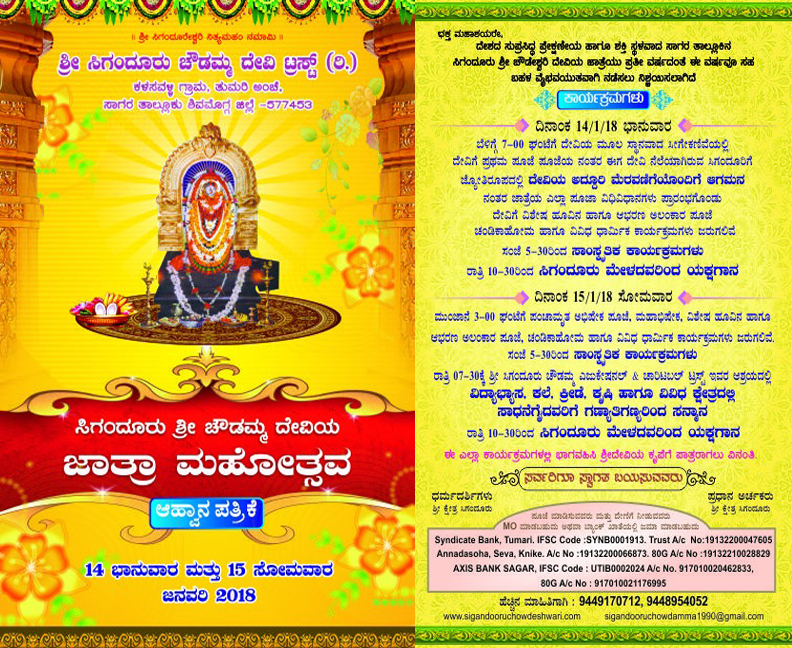 Every year on the day of “Makara Sankranthi” means 14th & 15th of January Sigandureshwari’s fair going on. On the day of makara sankranthi devotees get bath in holy water in river sharavathi & pray the godess. Shri choudamma devi has strength to proceed the fear of thiefs. The devotees who carry on benedicts will live happily without any fear of thiefs. If their any thieft taken place in the home of these devotees devi punished them. Other than Sigandur kshethra no other kshethra has this speciality. Protection from thiefs not only to themselves but also to their gardens, land, buildings, things etc… by putting the board “Shri Deviya Rakshane Ide”. By unknowingly if the thief stolen something from the place where the board is kept thief will definetly face several problems & kep back the things in the same place, is the trust of peoples. The Kshethra’s Religion head Shri S. Ramappa sir. Once Varadali Bhagavan Shri Sridharaswamy visited Sigandur. Their Shri Sridharaswamy prayered goddess to change devi from ugraswaroopi to mrudhuswaroopi & Sowyaswaroopi to protect the devotees. On the right most side of the temple “Bhoothada Katte” is there, lord Veerabhadra is their to guard the Kshethra. On the left side of the temple Shri Shaneshwara & Shri Raktheshwari Temple is there. Chief Archaka Shri S.P Sheshagiri Bhat is present in devi’s aradhane. From Sagar to Holebagilu via Avinahalli route. In holebagile Linganamakki back water is there. There is no bridge to cross the back water. Cross the back water using Launch. All vehicles in this way should use launch, back water is about 2 K.M wide. Launch is available for service only on fixed timings. On the other side of bank kalasavalli village is there. From kalasavalli to Sigandur Temple around 4 K.M far. The peoples who comes from kolluru, Nagodi Ghat, Thumari way reaches sigandur. There is no back water and from kollur to sigandur is around 45 K.M away. There is direct bus facilities from Sagar, Shimoga & Bhatkal to Sigandur. Since the number of busses is less, it is good to come in private vehicles. Welcome to Sigandur Temple official website www.sigandureshwari.com. Sigandur Shree Choudamma Temple Trust(R). ಮಕರಸಂಕ್ರಾಂತಿಯಂದು ಅಂದರೆ ಜನವರಿ 14 ಮತ್ತು 15 ರಂದು ಸಿಗಂದೂರೇಶ್ವರಿಯ ಜಾತ್ರೆ ಅದ್ಧೂರಿಯಿಂದ ನಡೆಯುತ್ತದೆ.